Your garage is a great place to store things–maybe even too good. It’s so easy to just throw junk in there, intending to deal with it eventually, and never get around to it. Out of sight usually means out of mind, after all. Here are some tips to organize your garage so you’ll have more space for summer DIY projects and winter storage, not to mention your car! Be Ruthless. Do you really need all those bent nails? Consider carefully what you plan to keep versus what you’re going to get rid of. If you haven’t used something all year, do you really think you’ll need it next year? Remember that Mr. Junk can haul all your junk from anywhere in metro Atlanta, and we recycle or donate everything we can. Creative Storage Solutions. Get some old-school lockers and assign one to each member of the family for rain gear, out-of-season outerwear, sports equipment, etc. This will make it easier to find things when they’re needed, and keep them out from underfoot. Have an old dresser hanging around? Use it to store smaller pieces like nails and tools all in one place. Label Everything. Don’t leave any opportunity for people (including yourself) to say they don’t know where things go! Don’t forget, the key to organizing almost any room is to get rid of what you don’t need. Mr. 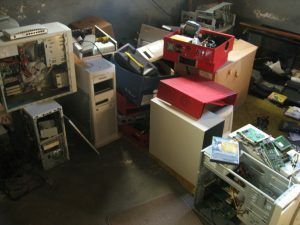 Junk will carefully, efficiently, and affordably remove all your unwanted stuff, handle it in the most eco-conscious way possible, and even sweep up after ourselves. Get a free quote today!